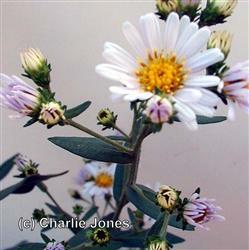 This cheery fast growing perennial formerly known as Aster Chilensis, now called, Symphyotrichum chilense, produces abundant pale lavender, daisy-like flowers with yellow centers in summer and into the fall. It is a good filler in a meadow garden, perennial border or an attractive container plant. This aster provides excellent nectar for butterflies, moths and beneficial insects. The Coast Aster is very garden tolerant, doing well in a variety of soils including clay. This plant grows to about 1 ft. tall and will spread. It requires sun to light shade and moderate to little summer irrigation. Plant with Epilobium and Solidago for a wonderful late summer color display. Prune in winter for lush growth the following spring.